Gorgeous renovations & beautifully cared for with curb appeal! Living here you’ll feel like you live in the country with farmers’ markets, organic farms, fresh donuts & cider, horses, hiking, kayaking, swimming & acres of forest BUT you’re just 2 miles to downtown & elementary school on same street. 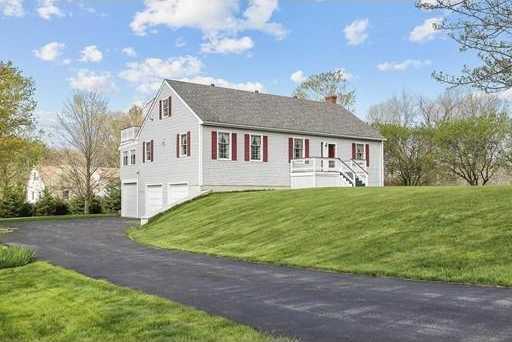 Easy access to 95/495 + train to Boston. With a home like this you’ll entertain every weekend either in your huge kitchen or on one your 20 foot deck! Maybe start a garden to go with the blueberries, apples and pears ? With a yard like this you could adopt a dog! Let the kids be kids or lounge peacefully in the sun with your iPad & ice coffee from your private master suite balcony. 2 master suites, one on 1st & one on 2nd. 2nd has a gas fireplace, coffered ceiling, 24X7 walk in closet & balcony PLUS huge master bath with marble & granite, jet tub, custom walking shower! Central AC, 3/4 car garage, Huge storage, Sun room, Laundry room, Lots of room!